With the release of Savage Worlds Deluxe, it does two things. First, it provides a full update to give a Third Edition of the Origins Award winning game. Second, it provides fans of the game with something that has been missing for almost five years now – a single core rulebook that provided everything necessary to play a game and run a game of Savage Worlds. Now in that time, the Savage Worlds Explorer’s Edition has always been available, and in that time, it has been a very handy, pocket friendly introduction to the game, but in that slim book, there were things missing, most notably the rules for creating characters that were not human. In the cases of these missing rules, players and GMs had to turn to the various setting and campaign books for these additional mechanics. Which to be fair is no bad thing, as Savage Worlds is both supported by, and supports numerous settings and campaigns such as dark fantasy across islands in the sky (Triple Ace Games’ Sundered Skies), Victorian Imperialism and adventure on Mars (Pinnacle Entertainment Group’s Space 1889), and investigation into dark nihilistic horror (Reality Blurs’ Realms of Cthulhu), as well as many, many more. In fact, in terms of single different settings and campaigns, Savage Worlds is one of the best supported available. What these settings have in common is the “Fast! Furious! Fun!” of Savage Worlds. The RPG focuses on action orientated, cinematic style play, with the player characters able to take down mooks or Extras with ease, but always having a fight on their hands when they face any villains, either minor or major. The system is also designed to handle skirmishes between multiple opponents, so that the players can easily engage in small scale wargaming as part of a campaign. In fact, Pinnacle Entertainment Group’s Weird Wars series, as seen in Weird Wars: Weird War II and Weird Wars: Tour of Duty, each of which takes place during World War II and the Vietnam War respectively, are written with this feature in mind as are many of the game’s Edges or advantages that a player can select during character creation or as part of experience gained during play. Nevertheless, Savage Worlds is an RPG, so the focus is always on the player characters. Each is comprised of his Attributes, Skills, Edges, and Hindrances (disadvantages), with both Attributes and Skills defined by die type – four, six, eight, ten, or the twelve-sided die. The bigger the die type the better the Attribute or Skill. Human characters start with a free Edge, whilst to play a Dwarf or an Orc or an Android, the player has to select a Race package that comes with its own benefits. Our sample character is from the setting of Tékumel: Empire of the Petal Throne and is a scholar-priest in the service of Thúmis, Lord of Wisdom, Knower of Arts, Hidden Seeker of Eternal Knowledge, and Sage of the Gods. Besides studying history, theology, and the ancient language Engsvanyáli, Uchang is trained as Dedaratlkoi, a bodyguard for the High Priests who knows how to fight unarmed and react instantly in times of danger. He wears form-fitting vambraces with which he can parry blows and even block arrows. To do anything, a player rolls the die associated with his character’s Attribute or the Skill as well as an extra six-sided Wild Die because the heroes – and some villains – are Wild Cards and thus unique in the Savage Worlds setting. The highest result of either die is chosen by the player as his result, with the maximum result or Ace on either die allowing a player to reroll and add to the total. The base target for most rolls is four, but can be higher depending on the situation. Rolling Aces usually enables a player to roll higher than the target, with results of four higher than the target providing Raises that give extra benefits. Every Wild Card has one or more Bennies, these used to get re-rolls or to soak damage. Combat uses the same mechanics with initiative being determined by an ordinary deck of cards. In general, Wild Card characters have the edge over their opponents, able to shrug off damage or soak it with the expenditure of Bennies before they start suffering Wounds. The combat rules in Savage Worlds cover not just man-to-man, man-to-Orc, or man-to-Xenomorph combat, but mass combat and vehicular combat too. The rules for mass combat lend themselves towards to the use of miniatures, either actual miniatures or counters, and the book comes with effect templates that can be copied and used with them. The treatment of Powers, whether they be Magic, Miracles, Psionics, Superpowers, or Weird Science, is kept very uniform in Savage Worlds. Each is fuelled by Power Points, each has an associated Arcane Background Edge and Skill, and each of the Powers can have an associated set of Trappings. So for example, the common Bolt Power could have different Trappings depending upon its source. Thus a wizard’s fire Bolt spell could have the flammable Trapping, potentially causing materials to catch alight, whilst a Gadgeteer’s Bolt Power could be an Electro-Zapper that with the Electricity Trapping causes target’s to spasm. What this provides is a flexible set of rules that are really only let down by the Superpower option, which feels underpowered and clumsily implemented. Were I to run Savage Worlds, it would not be in the Superhero genre. So for the second sample character, a spellcaster, we have a slightly reluctant agent who investigates the Occult for Crown and Country. His spells are geared towards to detecting and dispelling the arcane rather the zap-bang-pow type of magic. One interesting point about the character is that he has the Guts Skill, which is no longer standard within the Savage Worlds rules, but rather found in particular settings or campaign worlds. This is one of several changes made, and features included, with the Third Edition of Savage Worlds, such as providing ready-to-play archetypes; allowing character to select Background Edges, such as Arcane Background and Linguist, at any stage rather than only during character generation; and the aforementioned removal of the Guts skill from most Savage Worlds settings. Throughout the book, the authors step in to give “Designer Notes” on these changes and other subjects from roleplaying, healing and “the Golden Hour (a term for the first hour of treatment when the injured have a high chance of survival), to the naming conventions of Powers and keeping design setting simple. Beyond the game’s core rules, Savage Worlds Deluxe covers everything from chases and dramatic tasks to mass combat and “Interludes.” The rules for the latter set up simple scenes between the action in which a player gets a chance to relate something from his character’s past to the rest of the group, a nice new means to encourage roleplaying. Further, new Setting Rules allow a GM to tweak his game world, such as Fanatics, which has overly loyal goons leap into the path of damage that would otherwise hit a Wild Card villain – great for Pulp-style games with “larger-than-life” bad guys and High Adventure, in which player characters can spend Bennies to temporarily gain an Edge that they do not possess. The “Designer Notes” and new Setting Rules are supported by a solid chapter on how to be a GM. This covers everything from getting a group together and group etiquette to running the game and creating game worlds. Much like the rest of Savage Worlds Deluxe, there is no great depth here, but the advice given is never less than friendly and helpful. Savage Worlds Deluxe is rounded out with five “One Sheet Adventure,” short scenarios that can be played in a session or two. None of them are particularly sophisticated or complex and include a Viking mini-saga, a horror investigation, and a creepy zombies in space encounter. In several cases, the One Sheets make use of the Setting Rules given earlier in the book. In all cases, the adventures could easily be expanded upon, perhaps with sequels or even into campaign worlds with some effort upon the part of the GM. Physically, Savage Worlds Deluxe is a slim hardback done in full colour throughout. Its larger fount size makes it easy upon the eye and the book has quite a light feel. All of the art is in full colour with not a single bad piece amongst them. If there is an issue, it is that because the art is illustrating a set of generic rules, it does not give the book a cohesive feel. This though, is not entirely fair, because what the art is illustrating is the action that should be at the heart of every Savage Worlds game. 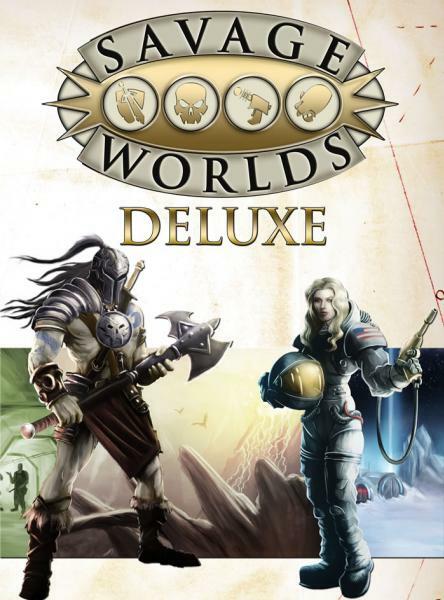 Now what is important to note with Savage Worlds Deluxe is that it is backwards compatible. Every Savage Worlds title would run as easily with the version of these rules as you would in those found in the Explorer’s Edition. That compatibility is one of the great aspects of Savage Worlds, this one set of rules giving access to numerous settings and campaign worlds. Another is the simplicity of the rules, which are quick and easy to play, and support cinematic, action-orientated play. All of which are presented in this very accessible hardback that should serve Savage Worlds for some time yet.